Why does that guy look so familiar? 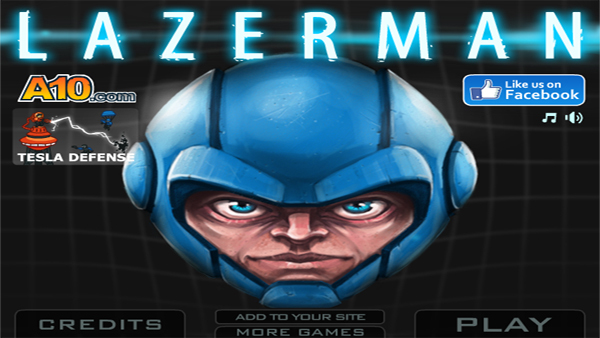 Should one judge the game Lazerman merely by looking at the art above, they’d more than likely think that Lazerman was but a cheap Mega Man ripoff in the guise of a browser game. While the over-sized head and helmet do strike an uncanny resemblance to the legendary “Blue Bomber”, the similarities end there. Somehow, the game’s protagonist got involved with a weird experiment that left him with nothing but a head and the ability to propel himself around via laser beam. Because the aforementioned experiment was not of the voluntary variety, he’s pretty ticked and has decided to take matters into his own hands…err head. His goal is to reunite himself with the body he was separated from while causing as much destruction as he possibly can to the scientific staff that subjected him to the horrific but sort of awesome laser themed surgery. Bouncing around as a disembodied head has never been more fun! The game is pretty simple as you charge yourself with LMB and use the mouse to aim where you want your head to go. 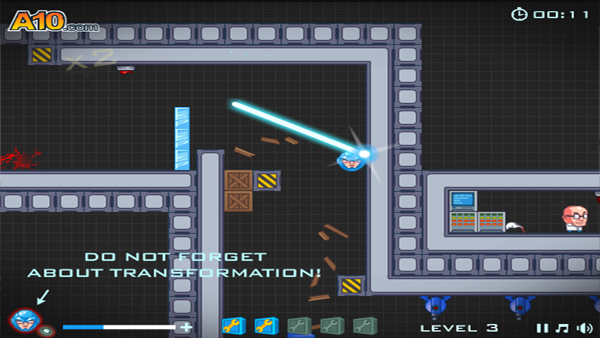 Each level features an exit that can only be unlocked by picking up special boxes, though that’s not all the fun that Lazerman has to offer. Because he projects himself at such high speeds and wears a really hard helmet, he makes a mess of anything or anyone that happens to be in his flight path. While it’s a bit silly to see a floating head bouncing all over the place, the impact is meaty and quite satisfying. If test animals could find a way to get revenge on the scientists that put them through hell on a regular basis, I’m sure this would be the prefered method. Lazerman is not completely indestructible though as security guards, turrets and other things can hurt your precious little head. Luckily, you also have the ability to turn into a tiny ball of ghost energy, rendering you invincible and invisible to your foes. Lazerman is a fun game and the ability to cause carnage in such a playful way is always a good thing. I do hope Lazerman finds his body, as long as his body is also fueled by lasers because if it isn’t, then what is the point of it all? ← More! Battlefield! Metal Gear Solid! Trailers!